Layering is huge at the moment and not just in fashion. Layering your skincare products can actually achieve great benefits for your complexion. By combining essential ingredients you can really achieve a greater glow and wonderful looking skin. SBC Skincare Gels are perfect for layering. 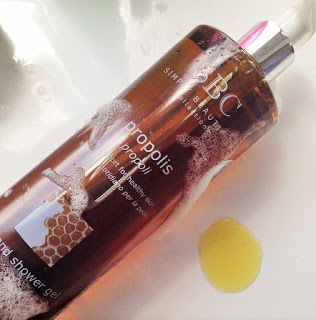 Propolis is an amazing mixture of sap picked up from plants and botanical sources that Honey bees collect to seal and protect their hives. SBC have managed to combine this beautiful, special and very expensive product into a gorgeous bath and shower gel, with amazing results. The smell is wonderful, it has a hint of honey, and almost vanilla scent to it and when used on a shower sponge, creates a gorgeous gentle lather. This is lovely to use when you need to feel extra clean, or if you have skin that may be prone to breakouts as it really helps keep the area clean and hydrated. It is a hard worker too so great to use if you have been doing any dirty, dusty, muddy work, gardening, working outside anything really when you just want to feel extra clean and cocooned. Its also great on scrapes and grazes, I bathe my youngest in it when he has been in the garden all day, or at the beach or just generally being a boy haha!! I add a few pumps under running water and also to his wash cloth. The 100ml is great to keep next to the sink as well as it is great as a hand wash. Again another amazing all round family product. Having the smaller size in this collection too means it is fab in wash bags of all ages when travelling etc. This gel is an absolute skin saver. This has been used for so many reasons in our household along with the matching shower gel. When my eldest son was going through his teenage acne phase, this was a godsend. This helped keep the area protected and clean and seemed to calm everything down. When my youngest son was going through the phase of picking the skin around his fingers, this again, helped calm and protect that area and soothe everything. In the winter this is great smoothed over chapped skin on the face, around the outside of the lips and cheeks. It works anywhere on the face or body that needs protecting from the elements and is dry, cracked, or blemished. This time of year this is perfect mixed in with foot lotion and rubbed into dry cracked heels, it works an absolute treat, also fab mixed in with hand cream. The possibilities of this one are endless. A great skincare gel to take on holiday with you too. This (Marine based) Collagen Gel is Amazing! I cannot even begin to tell you how many people I have bought this gel Gels for! Why? Because personally on me I know it works for my skin and I receive so many compliments. Used regularly my skin definitely looks firmer, my forehead lines less visible and across my stomach, marks from pregnancy have definitely faded with regular use. I know everybody’s skin is different but personally my results have been outstanding. It is great at dealing with the existing signs of ageing, wonderful on Crows feet around the eyes, it can also be used as a relaxing eye mask by squeezing a generous amount of this gorgeous pink Gel onto a cotton pad, fold in half and place under the eyes around the area where you may get dark circles! My dad – aged 70 – also adds a pump of Arnica to his Collagen and puts under his eyes and this helps him with swollen under eye bags and dark circles. You really can play around, mix and match and find your own unique blend of gels for you. Collagen is a naturally occurring protein in all our ligaments and connective tissues and skin, as we get older our Collagen levels significantly decrease, therefore leaving some of us with dry, creapy, ageing, droopy skin. This Gel is in such a huge size that you really can slather it on everywhere, I use this across my stomach, thighs and “bingo wings” and really massage it in well to help give a firming feel. I use it on my face, paying particular attention to my forehead and lip lines. It smooth’s in so easily, leaves no sticky residue, and allows me to apply make up straight away and get dressed straight after applying to my body. The great thing about these Gels is if you already have a body lotion that you absolutely love, then why not add a pump of this to that lotion? Everybody could do with extra Collagen so this is an amazing way of adding it. This brand new launch for SBC smells incredible! If you love that uplifting, zesty fresh burst of a citrus scent you are going to be bowled over by the fragrance of this gel. Encompassing Lemon Myrtle, Thyme, Macadamia Ternifolia Seed Oil and Lemon this is a real sensory experience. This is my absolute favourite fragrance from the whole SBC range, it’s so fresh and awakening and just make me really happy. It is fabulous for deodorising the body and freshening you up, plus it is also great at firming and toning the skin and adding radiance. Great to use on the jawline, to firm and tone that area and all over the body. This is a winner and I know on hot, sticky, summer days, this will be my new best friend. I cannot wait for you to try it. This whole collection is exclusive to QvcUk and is the Todays Special Value (TSV) for Friday 14th April only whilst stocks last. It will also be at an incredible price for that one day which I will add the link for HERE when the embargo is lifted. Have you tried SBC before? If so which are your favourite products? I would love to know, leave me a comment below. "Laura Geller Beauty Canvas – 6 Piece Artistry Collection – QvcUK TSV"
My husband uses Propolis Gel as an after shave, he likes it as it's gentle and doesn't sting. Our son likes it for his eczema and he'll be happy to use the Propolis Bath and Shower Gel too. I like Collagen Gel but I'm particularly looking forward to trying the new Lemon Myrtle and Thyme Gel. Sheila. I'd never heard of SBC before today. I like the sound of the collagen skincare gel. I'll keep an eye for these next time I'm browsing QVC. I haven't heard of this range but that lemon myrtle gel sounds so wonderful!